The Legere Synthetic Bassoon Reed collection has been described as "the most radical development in bassoon reed technology for the past 100 years", meeting the demands of both professional and student players. The Synthetic bassoon reeds have a premium quality feel with incredible strength, tonal warmth and flexibility. Immune to temperature and humidity change, and requiring no moisture before playing, these reeds last for several months, enduring long rehearsals and concerts on a regular basis. 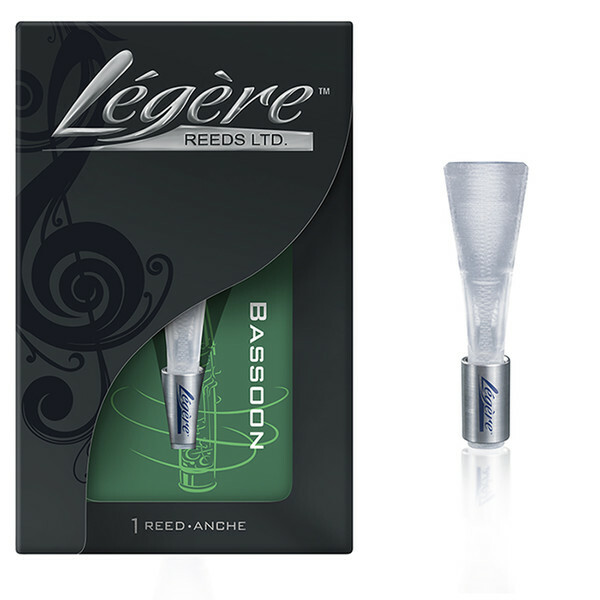 The Legere Bassoon Reeds are manufactured from Legere's own polymer, designed to replicate the grain and tonal characteristics of the highest quality premium cane reeds. They are cut into shape by computer aided precision tools to ensure the lowest possible error margins, and high quality control. The reeds are then cut in half and profiled mathematically before bonding via another digitally controlled system. The end result is a reed that provides tonal warmth and incredible projection, with outstanding flexibility. The medium-heavy size can produce a rich, deep tone, but still has the versatility to produce your preferred tone.